Career Highlights: Practicing labor and employment law and representing management for 30 years, Mr. Henderson has represented employers in over 25 states in all aspects of labor and employment law. He has handled discrimination jury trials in California, Iowa, Alabama, Tennessee, and Mississippi. He has successfully defended strikes and labor disputes and negotiated collective bargaining agreements in Pennsylvania, Iowa, Nevada, Oklahoma, Indiana, Illinois, Alabama, California, and New York. He has been recognized by his peers as being among the best in his field and was awarded an A.V. rating by Martindale Hubbell in 2003. Education: Mr. Henderson holds a Juris Doctorate from the University of Memphis School of Law (1983) and a B.A. from Rhodes College, Memphis, Tennessee (1980). 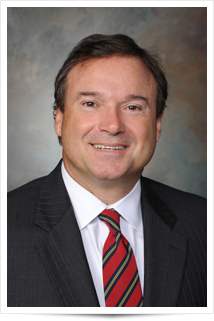 Bar Admission: Mr. Henderson was admitted to practice law in Alabama in 1996 and Tennessee in 1983. Courts: U.S. District Court, Southern, Northern and Middle Districts of Alabama; U.S. District Court, Western and Middle Districts of Tennessee; U.S. District Court, Southern and Northern Districts of Mississippi; U.S. District Court, Eastern and Western Districts of Arkansas; U.S. District Court, Southern District of Ohio; U.S. Courts of Appeals, Sixth and Eleventh Circuits; U.S. Supreme Court. Honors and Awards: Mr. Henderson was awarded an A.V. Rating by Martindale Hubbell in 2003. He is also recognized by American Lawyer as a “Top Rated Lawyer in Labor & Employment” for 2013. Professional Memberships: He is a member of the Tuscaloosa County Bar Association, the Alabama State Bar Association, the Tennessee Bar Association and the American Bar Association. He is also a member of the Defense Lawyers Association and the Defense Research Institute. He is a certified mediator in the State of Alabama. Community Involvement: Mr. Henderson is a member of the Human Relations Committee for the Business Council of Alabama. He is a graduate of the 2005-2006 class of Leadership Tuscaloosa. Mr. Henderson served on the Board of Directors and as President and Assistant District Governor for the Rotary Club of Tuscaloosa. He has also served on the Board of Directors and as President of Big Brothers and Big Sisters of West Alabama. He is a member of the Tuscaloosa Human Resource Professionals, the Alabama Press Association and the Inland Press Foundation. Presently, he is on the Board of the United Way of West Alabama and chairs the Future Giving Committee. He will also serve as Counsel to the Chamber of Commerce of West Alabama for 2014-2016. Speeches and Publications: Mr. Henderson is a frequent speaker to local and regional associations and employment groups. In addition to representing many in-house employers, he frequently presents to the Chamber of Commerce of West Alabama, the Inland Press Association, the Alabama Newspaper Association, the Tuscaloosa County Bar Association, the Tuscaloosa Human Resources Professionals Association, the Alabama Council of Community Mental Health Boards, the Alabama Recreation and Parks Association, and the West Alabama Worker’s Compensation Association.